similar ones in Rosemarkie, Contin, Alness – and London! This story is about the sculptor behind the stone. There were fashions in the design of gravestones just like anything else. You therefore have to be careful when comparing stones between different locations, because you may be comparing the fashion of that particular period rather than the work of the same sculptor. Nevertheless, there are such strong similarities between some stones at Kirkmichael and Cullicudden and elsewhere in the North – and further afield – that we would tentatively suggest they were by the same sculptor. Not that they are identical – far from it. Instead, it is as if the artist had a palette of features executed in a certain style, and, depending on what the patron wanted, would deploy them to produce a stone unique to the occasion, but with his “signature”. Let’s have a look at some of them. 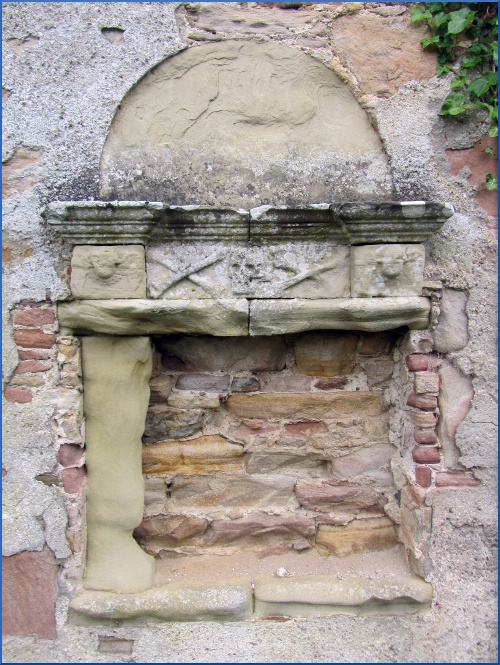 A picture of a stone at the Parish Churchyard Rosemarkie graces the cover of the Highland Family History Society (HFHS) booklet on Monumental Inscriptions for that burial ground. There has been a long-standing relationship between the Kirkmichael Trust and the HFHS – members of the Trust have been members of the Society for more than 20 years, have presented talks at HFHS meetings and have written countless papers for the HFHS Journal. A similarity between this image and our own Elphingston stone at Kirkmichael prompted contact to be made with Harry and Joan Clyne, now living at Lochailort, who had taken the original photograph back in the ’90s when helping the HFHS to record the stones. They very kindly supplied this image (which I have adjusted to bring level for comparison). Our own is under cover at the moment, but its image was captured just before it disappeared. Here lyes the body of Thomas Hood, son to Thomas Hood, tacksman in Pediestoun, a young man of 22 years of age, who died Juley the 2 day 1730. The words originally incised on the riband (Memento Mori) on some of the stones of this era are usually too worn to be distinguished but on this stone were still sharp and clear. The inscription on the Kirkmichael stone gives a similar primary date, and bears the same, albeit typical of the time, ligatures which reduce, in both cases, THE to one symbol. The symbols of mortality are the same as on many post-Reformation stones, but the heavy loops of mantling, the helm and other stylistic similarities are so great that despite the obvious variations that the sculptor introduced that I would be very tempted to say the same hands created both. Ian Fisher of the RCAHMS (now absorbed within Heritage Environment Scotland) when visiting the area back in the 1990s drew attention to one of the remarkable stones at Cullicudden (Cullicudden “D”) and suggested “This fine slab is evidently by the same carver as one at Contin, Ross-shire”. The Trust went on a journey of exploration in 2015 to Contin to see for themselves. The Contin stone has had a few knocks in its life, and has suffered erosion, but is nowadays safely inside the Contin church, admittedly not in the best location to display its charms but at least secure from further wear and tear. I would agree with Ian Fisher that the two stones display the same style. As remarked already, no two of any of these two stones are identical, but the sculptor used a palette of effects, and this was as true 700 years ago as it is now. 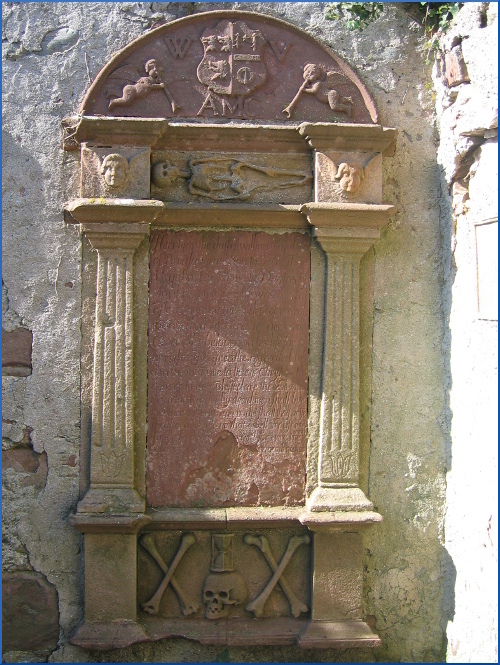 I think it was Lorraine Evans who first drew my attention to the similarities between this memorial in Alness Kirkyard and our Urquhart of Braelangwell Memorial in the former chancel at Kirkmichael. She had been collecting material for a Memento Mori exhibition in the Cromarty Courthouse Museum, which was on display in 2016. Hector Munro of Foulis and I have discussed the similarity since on several occasions. Master John Fraser and his wife, Jean Moffat, the subjects of the memorial, were subject to imprisonment and banishment for their religious beliefs back in the late 1600s. 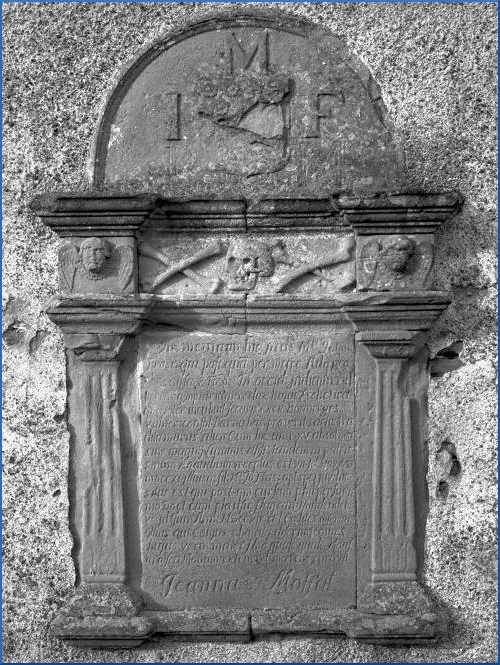 William Urquhart of Braelangwell, the primary subject of the Kirkmichael monument, was not subject to the same strictures, but his father, who is mentioned on this stone, the minister Thomas Urquhart certainly was, so there is another link between the two. 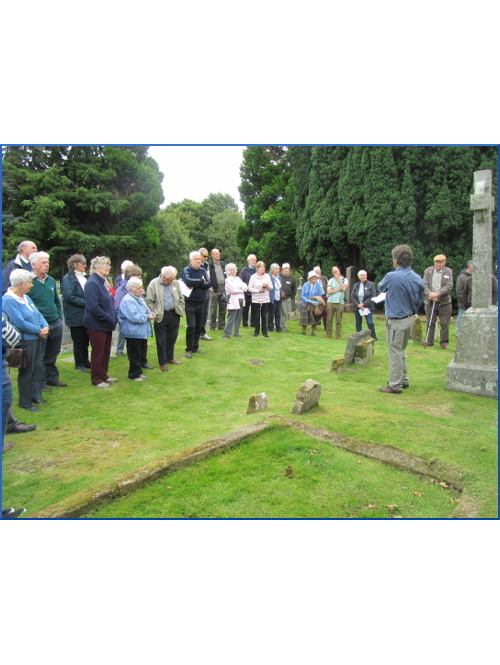 The Kirkmichael Trust toured Alness and Kiltearn Kirkyards in August 2016, and as part of the guided tour took a close look at this stone. Alas! The stone which was so striking when photographed by the RCAHMS back in the 60s had weathered to a most distressing extent. 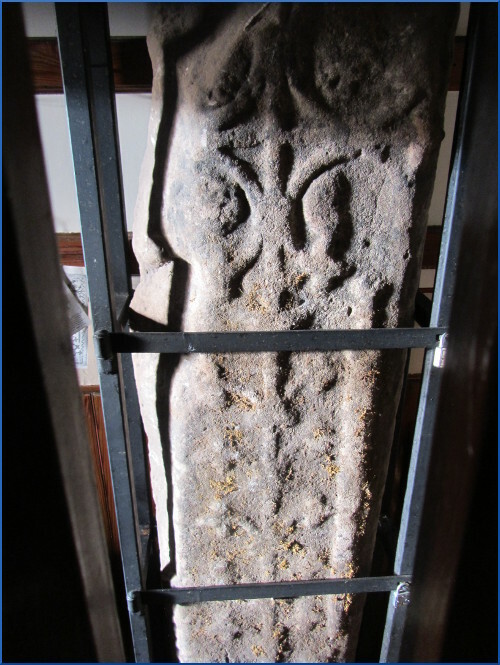 This is one of the most striking arguments as to why these valuable stones should be covered – the Trust had to argue long and hard for a roof to be replaced on the chancel at Kirkmichael within which the sister of this memorial currently lies exposed. From the old photograph of the memorial, nevertheless, hopefully the striking similarities between the Kirkmichael and the Alness stones can be made out. 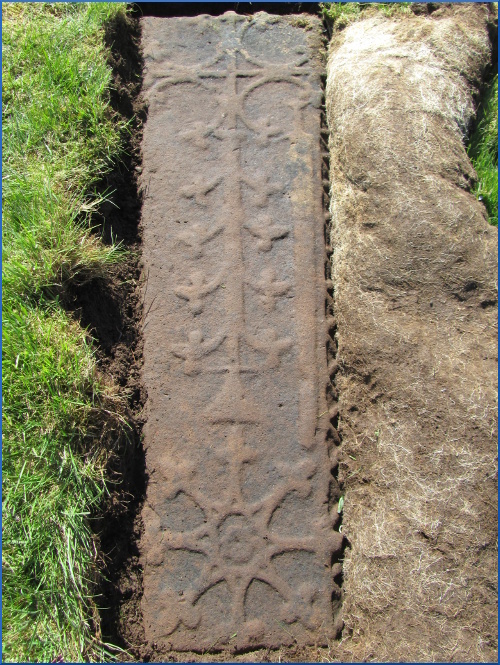 The Alness stone was in Latin, whereas the Kirkmichael stone was in English, the shape of the memorial and the layout of symbols is also somewhat different, but I think you will agree there are such striking similarities in style they may well have been made by the same sculptor. 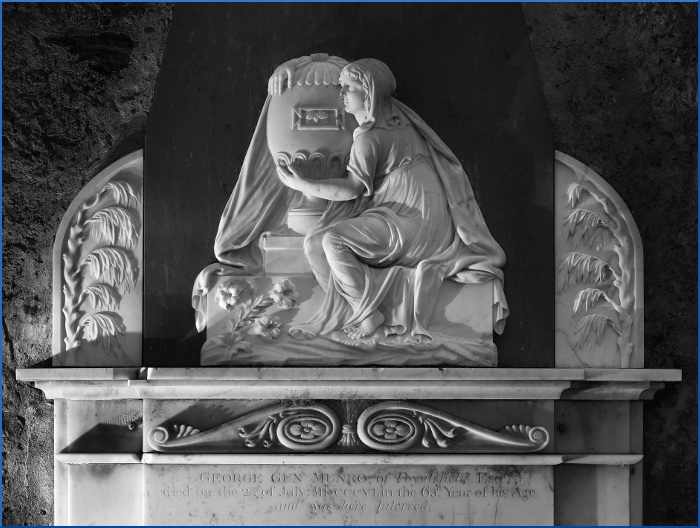 And finally, one stone where nowadays we know the sculptor is the wonderful memorial in the Gun Munro mausoleum in the former nave at Kirkmichael. Another Story behind the Stone will celebrate the work of memorial sculptor Charles Regnart, who worked principally in the London area. How marvellous it was when we found that the Gun Munro memorial actually had, in a tiny inscription near the base, the name of Regnart. The Gun Munro mausoleum had been built by George Gun Munro in honour of his uncle Sir George Gun Munro, but he ended being buried in it himself upon his death in 1806. I assume it would be his wife, Justina Dunbar, who commissioned the memorial. Gun Munro‘s early financial dealings had been in London and he had all the contacts there, and of course distance is no object once an object is on a ship, so I assume that the memorial and its inscription would have been ordered direct from Regnart in London and delivered in its component parts by ship to Cromarty, where it would have been taken by cart to Kirkmichael. Here are a few others which are very reminiscent, but not in my view anything like so beautiful, as our example at Kirkmichael. The first, on the left, is at Higham St Mary in Suffolk and has an urgently clasped urn like ours. The second is from Hinxton in Cambridgeshire. And finally, on the right, and perhaps most significantly, is a memorial to several of the Davidsons of Tulloch. 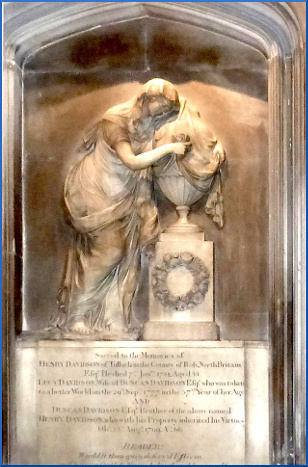 In All Saints Church in Kingston-upon-Thames, London, there are several memorials to the Davidson family. The Davidsons of Tulloch were wealthy merchants with estates in the West Indies, and the Gun Munros were closely associated with them. The filing system still in a cupboard at Poyntzfield House has a docket labelled Davidsons & Barkly &co. 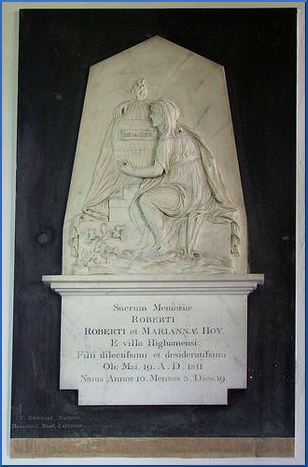 In All Saints Church there is a memorial to three of these Davidsons (Henry, Lucy and Duncan). 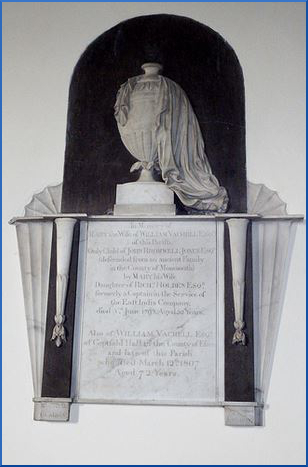 This eighteenth-century monument depicts a diaphanously-robed woman weeping over an urn, and I do wonder if the Davidsons had recommended Regnart to Justina Dunbar for a suitable memorial on the death of her husband, George Gun Munro.